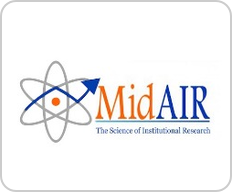 On behalf of the MidAIR Board of Directors, thank you for joining us at the 37th Annual Mid-America Association for Institutional Research Conference. We hope you'll take this opportunity to network with IR colleagues, learn about IR products from our sponsors, discuss current issues in Institutional Research and enjoy learning new or different ways of accomplishing IR tasks. .
Scientific processes, methods and systems to extract knowledge or insights from data. We are really excited about our Keynote speakers sharing their experiences and knowledge of data with you. As data & “Big Data” are now a huge focus in most industries we hope to learn not only from other IR professionals but also other professionals about how they work with and use data. The board has worked diligently to put together an outstanding lineup of professional development opportunities (PDO's) and concurrent sessions. Wehope you will take advantage of the informative topics, and find them valuable and timely to your work in institutional research. The success of this event is due to the work of my fellow board members. My sincere appreciation goes out to my colleagues and friends; Abby Benz, Dan Ferguson, Egon Heidendal, Shonda Ireland, Randy Sade, Bobbie Augspurger and Cyndi Louden. I would like to extend a special thanks to Egon Heidendal as he completes his service on the MidAIR board. I would also encourage all of you to consider serving the organization as a member of the board. It is a truly rewarding experience. During our time in Kansas City, I hope that you take an opportunity to enjoy the Power & Light District, use the Streetcar to check out the City Market, Crossroads Arts District & Union Station, as well as the chance to network with fellow institutional professionals. Thank you for your support of the MidAIR organization, and here's to a successful 2017 Conference!